This baked cod fish recipe is ideal for a family meal. The milk is used as a base for a white sauce which you can pour over mashed (creamed) potatoes and vegetables. I particularly like peas and broad beans with a white base sauce and fish - cauliflower or broccoli (calabrese) also go well with a white sauce. Personally, I like a slightly 'sharp' taste to my white sauces and I add 1 tspn English Mustard powder to my cornflour before I make it into a paste - it's not to everybody's taste, but experiment with the idea. Alternatively, you can mix in some mustard with seeds to make it more colourful as I have done here. The shrimp (prawns) are optional - add them or leave them out or add some other flaked fish if you like. 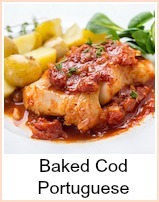 And of course, you can substitute any fish you have for the cod. You can cook this in a shallow pan on the stove top, just simmer for five minutes until the fish is cooked through, but if you opt to bake it in the oven, you have time to prepare and cook your vegetables whilst the fish is cooking. Grease an ovenproof dish and put the cod steaks in. Pour over the milk and dot with butter. Cover the dish either with a lid or some tin foil. 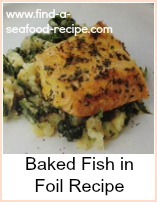 Bake for about 25 minutes until the fish is cooked through. Remove the fish and keep warm. Put the milk into a pan and bring it up to the boil. Take it off the heat and stir in the cornflour paste. Return to the heat and allow the sauce to thicken, stirring all the time for about 1 minute. Add the prawns and parsley and allow to cook a further minute or so. 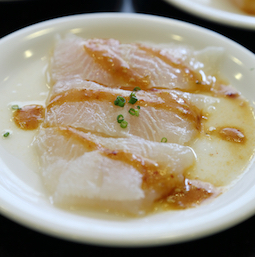 Serve the fish with the sauce poured over. 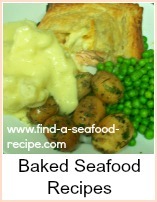 A very simple baked cod fish recipe that you cook in milk, then make a pouring sauce out of that. You can add some chopped parsley and a few shrimp to make it super luxurious and tasty.